Did you forever want to live in a tree house when you were younger? What better way to sleep than directly under the branches of a protective tree among the stars? And, while some tree houses are minimalist by their very small nature, today’s tree house architects have gone beyond small stature to include tree houses fit for hotel rooms, lodges and restaurants. 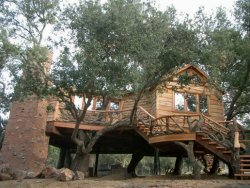 Other tree houses, although small in scale, have risen to the ‘green’ challenge to become ideal tree homes that do little to no damage to its host tree. Tree house fans, no matter how experienced (or not), can find hands-on information at the annual World Treehouse Association Conference. Michael Garnier, the owner of Out “N” About Treehouse Resort, holds this event every Columbus Day weekend. This conference typically attracts 40 to 60 people, ranging from builders like Mr. Garnier to novices itching to build their own houses among the stars. No matter if you want to purchase an existing tree house or build one for yourself, the value of learning from experts is priceless. 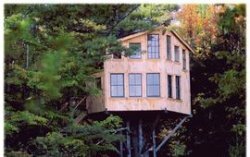 In the meantime, you can peruse the following list, which contains tree houses that are for sale, or tree houses that can be purchased as a mass-produced item or – simply – tree houses that you’d love to live in. Although this list is numbered, this does not mean that we value one tree house over another. The Manor: Andy Payne, director of BlueForest TreeHouses, is obsessed with building some of the most innovative and dynamic tree houses for his clients. He and his crew build tree houses that range from children’s fantasy playhouses to treetop lodges, hotels and restaurants. They have built their creations all over Europe from Greece to Italy and France, and Andy’s staff is fluent in French, German and Spanish. The image shown here is called, “The Manor,” a luxury tree house at its most sumptuous. The price tags for these crafted beauties range from £20,000 upward. Alnwick Treehouse, UK: The refurbished Alnwick Gardens in the UK features this impressive structure, opened to the public in early 2005. 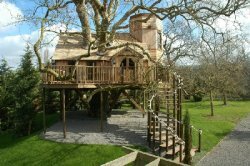 The client, the Duchess of Northumberland, wanted to build an archetypal tree house out of a fairy tale, with an organic feel that would blend in with the trees and landscape. Everything had to conform to building regulations, fire codes and the Disability Discrimination Act. The house consists of a large restaurant with an open fire, meeting space and smaller outbuildings. Wheelchair accessible, the building also an expansive deck and a rope bridge loop behind the house. The building is held up with a combination of a huge network of wooden braces, concrete foundations and two concrete towers hidden within the design. This tree house was designed by Napper Architects and the concept drawings initially were produced by The Treehouse Company. The actual build was carried out by Sir Robert McAlpine Limited at a value of £3.2 million. 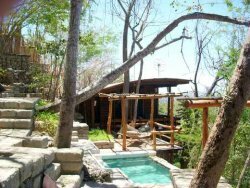 San Juan del Sur Tree House: At some point in your life, you might need to ask yourself whether you want to spend $299,000 on a home in Ohio or on a tree house on the beach in Nicaragua. Think about it – after you spend a day on your Pacific Ocean beach, you climb up for a refreshing dip on your pool and then relax in your hammock as you stare at your new home, which is supported by massive eucalyptus trees with a high curved ceiling that allows for natural air circulation. This home, therefore, contains a passive cooling system and includes solar heat as well. This home contains three decks, and one is completely covered. The parking area above the house is completely fenced with teak logs for privacy, and home itself is built of sustainable woods that blend beautifully into its surroundings. Designed by Matthew Falkiner, this 1900-square-foot home is built within a nature preserve only a few minutes’ drive down the hill to the beach. The house contains two bedrooms, two baths, huge 10×10 screened windows with an ocean view. All amenities are included, so you won’t be roughing it at all. In fact, you’ll only be twenty minutes from San Juan del Sur, a Nicaraguan resort community. 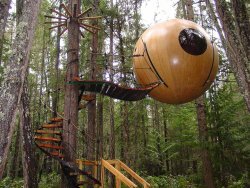 Ewok Tree House: Tom Chudleigh made a name for himself a few years ago with his Free Spirit Spheres, Ewok-like structures that are suspended from trees. Originally designed as a spherical boat, these tree houses are built with wood and a fiberglass covering that offers waterproof exterior. The interior of the house features a working kitchen with accessories including microwave, refrigerator and sink, and can be tailored by including beds and bronze doors. While you now can purchase these spheres for $152,000 fully decked out, the budget-minded tree house fanatic can purchase other options from Chudleigh through his Web site. These choices range from the basic framework kit to the fiberglass-covered shell to all the add-ons including acrylic windows. If you don’t think you can hang your finished product, Chudleigh offers to hang or take down your house for a fee. Other services include assessment of groves and sites and custom designs. Waipio Valley Treehouse: If you know how difficult it is to gain a lease on property in Hawaii, or if you understand the ‘legwork’ it takes to gain access to said property when it crosses through other lands, then you’ll appreciate the price on Linda Beech’s tree house in Waipio Valley on the Big Island. First, available ‘fee simple’ (freehold) land in Waipio is slightly less rare than hens teeth. And, Linda did you a favor by snagging legal road access to her tree house through a court decision rendered in 1998. Once you meander along an abandoned sugar cane road, you’ll see your future property. Linda has stated, “The Treehouse was built by Steven Oldfather and Eric Johnson, who are better known for being excellent boat builders, and they did an outstanding job. It is built on stainless steel pins and it’s just as level now as when it was built in 1973. The tree was then estimated to be 175 years old, which now means that it’s well into its second century.” Plus, you have a toilet and shower and the views overlook Hiilawe waterfall. But, you moved too slowly – this magnificent tree house recently sold for a mere $1,050,000. Tree House on Ten Acres: At first glance, it appears that this family is trying to sell a 3,800-square-foot four-bedroom home on ten acres. But, don’t be fooled. You’re really buying a quality cedar siding tree house with cedar built-in bunks and cabinets with brass hardware. The tree house windows are double hung brown aluminum storms with screens, and it has a secure deadbolt lock and a battery-operated security alarm. The solar collector transmits electricity to the 12-volt cycle battery that powers a switch-operated ceiling light and cigarette lighter socket outlets. 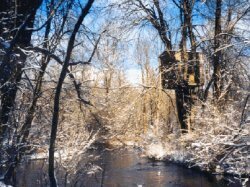 The view is amazing, as the tree house sits high above Paint Creek near an artesian spring and stream-fed trout pond. You also get that four-bedroom, four-car garage in this deal if you want it. All for the amazingly low price of $1,750,000. Treehouse B&B: Ok, so this ‘for sale’ property isn’t built up in the trees; however, this view and the name along with surrounding Douglas Firs, Cypress, Pacific Dogwood, and a multitude of other trees can offer a simulation of a tree house for those who are afraid to climb ladders and walk across swinging bridges. 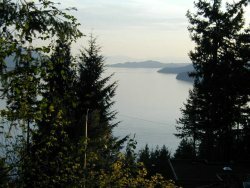 Although this building has a history of a bed and breakfast inn, it is being sold as a primary residence complete with lake views, bears, and an easy thirty-minute drive from downtown Vancouver. This is an ideal home for the sports-minded, as golfing, hiking, mountain-biking, water sports and more are all waiting outside the front door. Call the current owners for a viewing if you’re interested in the $1,239,000 price tag. O2 Treehouse: Possibly one of the most eco-friendly treehouses around, the O2 Treehouse serves many purposes. It is a place for reflection, social gathering and day-dreaming; for observing nature, holding group meetings and team-building activities. Perhaps its most intriguing aspect is its ability to adapt to large-scale design and implementation projects. It uses 100% sustainable materials and does not harm the growth of the host tree in any way. It will fit in any tree, single trunk, multi trunk or even multiple trees in a forest. 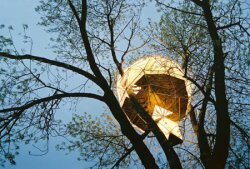 Hanging like a giant mushroom above a forest floor, the O2 Treehouse even comes in stealth mode, much like the ‘predator.’ Dustin Feider, the designer of the O2 Treehouse, has set out to revolutionize not merely tree houses but the entire concept of habitat. For Feider, the tree house is a symbol of the entire sustainability movement and a beacon of hope for man’s survival. While this unit isn’t for sale, a trip to his site will reveal how the O2 Treehouse is built. This catalog also supplies insights into various models, including an on-ground model and a model designed for areas that don’t contain trees. Treehouse Chronicles: There are times when you realize your age, your ambition, your competition and your fear of heights. At this point, you may be satisfied with kicking back, reading a great book on how to build a treehouse and just take a nap. In this case, the Treehouse Chronicles: One Man’s Dream of Life Aloft might be your cup of tea, as the house shown is the main subject of this book written by the “treehouse guy,” Peter Lewis. The tree house is a 300-square-foot timber frame hideaway, and the book is a large format coffee-table book that has gone on to win seven national book awards. In the meantime, you can follow the link to Mr. Lewis’ blog, where you can find more photos and details about the house and the book. Once you read on, your age, ambition, competition and fear of heights may mean nothing to you – after all, you deserve as much as Peter Lewis, right? You are absolutley correct. I would love to live in any one of these. Nice buildings. Especialy Retirement Home! I’d take up living in a treehouse. That would be so cool. These are some pretty awesome treehouses. we are looking for wood houses sellers from turkey..
we have lots of wood houses in our web site.. you can visit us . The tree house on the big island Hawaii was featured on a tv show about unique places to take a vacation. A person could rent that tree house for a price..it wasn’t an outrageous amount as I recall. But the road was not in the package deal, one had to hoof-it for a few miles to get to it. I thought it was on Kauaii tho. I guess I should have made that reservation way back then. In 1975, I lived in Waipio valley on the beach for a time. 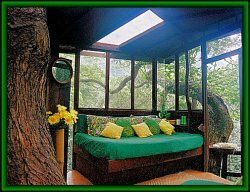 A guy named Gary lived in the Waipio treehouse then, which was basically a hippy haven where we used to go and smoke pakalolo and “meditate”. Gary used to work with us occasionally at the food co-op in Hilo, and many years later, I was running a shoe store in Bakersfield CA and sold a guy from Hawaii a pair of hiking boots. We got talking about Hawaii and Waipio, and all of a sudden I recognized him – it was Gary! What were the chances of THAT? Ha! He was in CA to visit one of his kids. Looked a bit different cleaned up. He had sold the treehouse and moved on by then, and apparently the real estate bubble blew the asking price of the hippie haven sky high. I howl hysterically at the astronomical price of that treehouse. How dumb can people be? If you do your job right, the trees will continue to grow, but you won’t have to re-build your treehouse every year. Based in New Jersey specializes in bank-owned, REO, foreclosed and distressed properties. Currently serving northeast, the firm is quickly expanding into a nationally recognized company and leader in the industry. Why did we leave the trees again? Better than living in a box in the dirt I’d say. I have a tree house located in 40 acres of woods. It has sleeping for 4 people, out door fire place and out door “John”. A wall furnace keeps it warm in the winter. We have some solar power for light. I’m working on getting running water and a shower. This weblog seems awesome. Go on with this good job and pls write some more information like this. u can al so check our site to. An interesting, creative possibility to live, when no longer possible to live in houses on the ground. Some are built a little higher than others. Great, if you’re not afraid of heights!